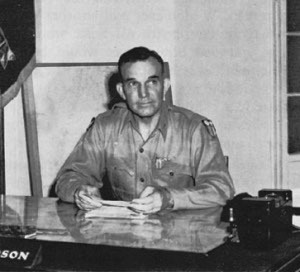 The Pacific War Online Encyclopedia: Davidson, Howard C.
Table of Contents Next: Davies, Henry L.
Davidson commanded 14 Pursuit Wing at Wheeler Field in late 1941, and was responsible for organizing a proper radar-based air warning system for Oahu. He was unable to fully overcome the peacetime mentality that hindered development of early warning facilities and training of personnel, and when war broke out in the Pacific, he saw half his modern fighter strength destroyed in a few minutes. When Chiang Kai-shek demanded the relief of Clayton Bissel (who got along very poorly with Chennault) as commander of 10 Air Force, Davidson became its new commander, proving "consistently helpful and co-operative" during the drive on Myitkyina (Romanus and Sunderland 1953.) He also briefly wore a second hat as commander of the Strategic Air Force of the Allied Eastern Air Command. He was an advocate of low-level attacks on Japanese shipping off the China coast. Graduates from West Point. Assigned to 22 Regiment.